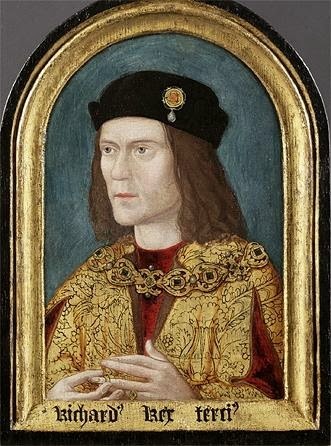 'Richard III: Leicester's Search for a King'. This exhibition was opened almost immediately after the announcement that the remains found at the Greyfriars dig were indeed those of King Richard III. The exhibition will run until the new visitor centre is completed and opened to the public. "Leicester is very privileged in having one of the best preserved timber framed halls in the country, dating back six hundred years. The Guildhall has had many uses and lives. The Great Hall itself was built in about 1390 as a meeting place for the Guild of Corpus Christi (a small but powerful group of businessman and gentry).Over the next hundred years the Great Hall was extended and the two wings at either end added. By the end of the 14th century the corporation of Leicester had begun to meet in the Guildhall. When the Guild was dissolved in 1548 the Corporation bought the buildings for the sum of £25 15s 4d! In 1632 the Town Library was moved into the East Wing of the Guildhall from St Martin' s Church. It is the third oldest public library in the country. At about the same time the ground floor of the West Wing was refurbished as the Mayor's Parlour. The Great Hall was often used as a courtroom and a jury Room was created above the Mayor's Parlour. The Guildhall was also used regularly for theatrical performances, banquets and civic events. With the growth of the town and the expansion of local government functions in the 19th century it became increasingly clear that, as a town hall, the Guildhall was far too small. After much debate a new Town Hall was built on Horse Fair and opened in 1876. For the next fifty years the Guildhall was used for several purposes including the headquarters of the local police and a school. It became very dilapidated and there were even calls for its demolition as an eyesore! Fortunately, the council decided to restore the building and following a major renovation programme it was opened to the public as a museum in 1926. Objects on display also include a case of items from the Grey Friars excavation, including decorated floor tiles, a silver penny of Richard's brother, Edward IV, and a section of carved stone frieze from the wall of the Grey Friars church. There is also an accurate model of the Blue Boar Inn, the building in Leicester where Richard spent the night before leaving for Bosworth." I visited the exhibition when it first opened, and have taken friends over the road to have a look around on a number of occasions since then. I was particularly pleased to have been able to see the facial reconstruction of Richard III close up when it was on display at the exhibition and took a few photos. Unfortunately, the photos are not great quality due to the reflections from the glass display case. However, you certainly get a great idea of what it was like to look at the nearest thing we will ever know to a true likeness of Richard III. The Richard III exhibition is open daily at the Guildhall, next to the Cathedral, from 11.00 am - 16.30 pm. Admission is free!